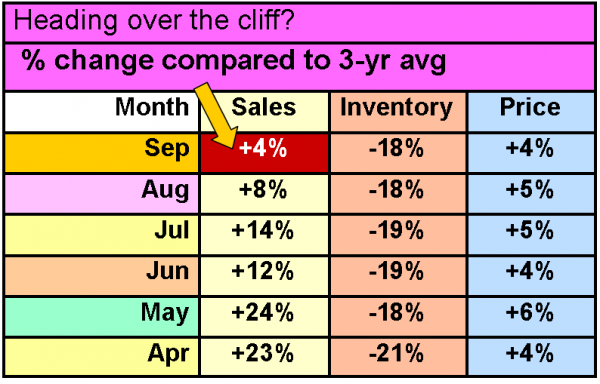 More importantly, it appears from the table below that we will see decreased sales in October if the trend continues. We’ve had eight consecutive months of sales increases, but I predict that will come to an end next month. What’s the reason for the imminent sales drop? 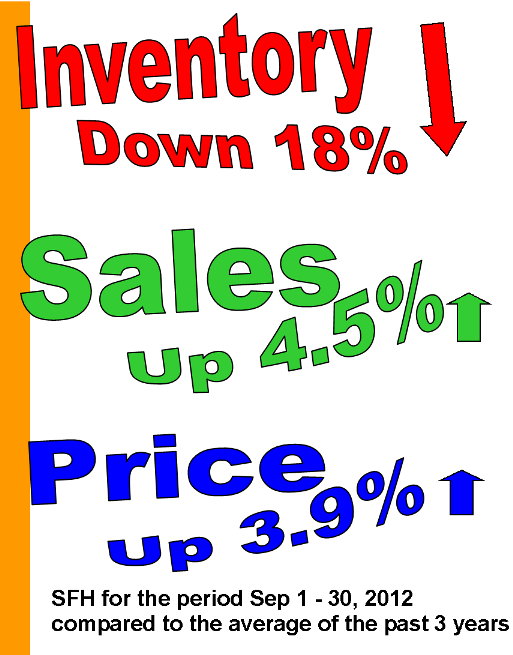 We’ve had sales increases despite extremely low inventory. Is the long-awaited correction finally going to hit Calgary, or is it that buyers have finally run out of homes to purchase? Hi Bob. Mike did a similar article and his stats were a little different. Any reason why? I posted this on the Greater Fool.ca but I expect Garth will censor it. First-time buyers are commonly referred to as the lifeblood of the real estate market. Purchases by FTB allow move-up buyers to upgrade, and so on up the chain. In September 2012, purchases by FTB were up 6% compared to the 3-year average. They were paying 2.3% more on average, and the homes they bought were 1.7% smaller. as long as there are more buyers, than sellers prices go up.. but at a certain point buyers start looking at the fundamentals, and decide they want out. with real estate, that process takes months. its not going to happen in a week its going to be months…. nortel, bre-x, etc, there were buyers right at the very end paying higher prices until – well we know how that turned out. the rest of the country is starting to change momentum – calgary will also. i feel bad for people paying more than average for something smaller… the sellers are probably sleeping easy… i know i sure would be. Maybe the better question us – how much more debt can people take on?